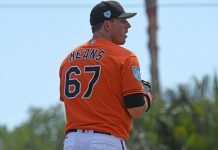 The Orioles 1st round selection in the 1018 draft (11th overall) opened some eyes in his initial pro look. At 6-5, 230 pounds, Rodriguez is already physically mature and does a good job of repeating his mechanics which includes a high front side glove that adds a bit of deception. His fastball sat 90-94 in his pro debut in the GCL with some late boring action that can get him some ground balls. He’ll also elevate the pitch for strikeouts. His best off speed pitch is his 77-80 MPH 12-6 curveball that gets swings and misses. He also has a 83-55 MPH slider that acts more as a cutter and a changeup that has flashed solid average at times, but needs continued work. He’s shown maturity on and off the field and has good mound presence. Held GCL batters to a .550 OPS and allowed only one extra base hit (double) over his 19.1 IP. Most young pitchers don’t need a changeup in high school so it’s a pitch that he’ll need to develop to reach his lofty ceiling. Will the command of the off-speed stuff improve with experience and the biggest thing with any young pitcher, will he stay healthy? Rodriguez has the look of a work horse starter with a 4-pitch mix, good mound presence, and a solid work ethic. Although he has a mature body, as his man strength kicks in over the next few years, adding a few MPH to his fastball can’t be ruled out. 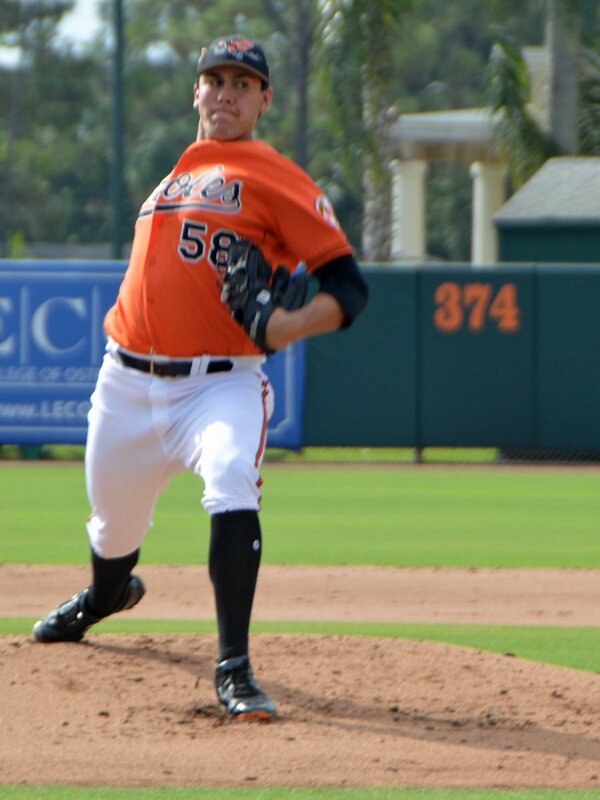 Think good Chris Tillman. Although he’s probably a mid-rotation starter, with some development and a few more MPH on the fastball he could reach his ceiling of a #2.